A most Happy Thanksgiving weekend to you all! 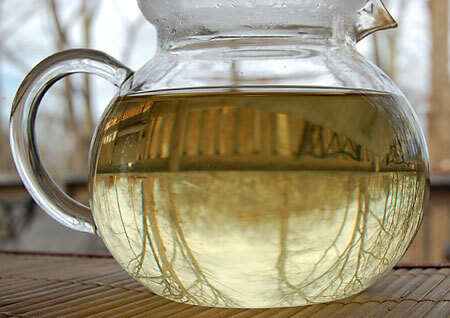 While the wind howls at the eaves outside, I am inside cozily sipping from a cup of this exquisite Formosa white tea. I watch the empty tree branches bow and sway and think about how resilient they are. 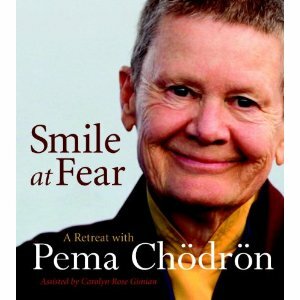 While outside forces seek to move them, they simply go with the flow of the wind and then bend back to their original shape. Having strong roots and an inner core helps ground them against these forces. The trees have much to teach us about life and change. Tea is firmly woven into Taiwan culture, with tea houses or “tea-art” shops located all over the island. Its old fashioned name, Formosa, is Portugese for “beautiful island”. Many Taiwanese families collect teaware in the form of unglazed clay pots. Sounds like my kind of place. I love that they refer to their tea shops as “tea-art” shops! Most tea grown on the island is processed as Oolong tea, or Wu-long tea. That’s what makes this particular tea very unique as it has been processed as a white tea. 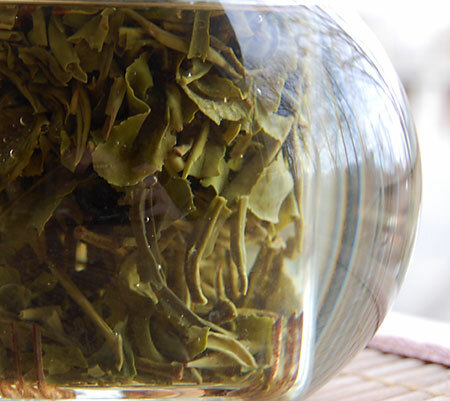 White tea leaves are allowed to dry slightly first and then heated up right away to prevent oxidation (darkening of the leaf) from occurring. I steeped the leaves for 3 minutes in 180 degree F water. The aroma is fresh and delicate. The words I would use to describe the taste of this tea. Clean. Fresh. Soft. Buttery. Smooth. Fruity, just a whisper. 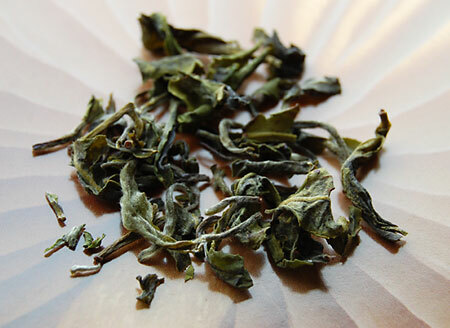 Unlike the teas I have reviewed lately, this tea is crystal clear, a pale, straw color. About 10 years ago, I attended an arts and crafts show locally and purchased a set of teabowls and a teamug. This is my favorite piece. 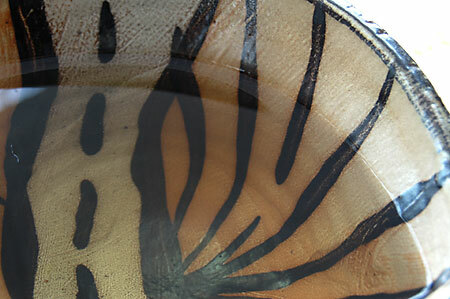 I remember how the potter told me that she dreamed the symbols she painted on her teaware. I love the road running through this one. The road of tea, one that I am most happy to be on. I can’t recall the potter’s name. I think that she was from Colorado. If anyone recognizes this work, please do let me know as I would love to contact her and see her new work. Last Wednesday, we had a tea and cheese pairing/tasting at work. It was a new experience for me and introduced me to the wonderful world of specialty cheeses. So far, my experience has been very limited in that area. I took some photos and am hoping to be able to post and share my thoughts with you soon. This weekend will be spent painting my bathroom over at my new place. Starting several weeks ago, they ripped out the ceiling, walls and floor to reveal the inner structure of the room. Now everything has been transformed with new wallboard and beadboard. I’ve been pouring over Benjamin Moore paint chips and never realized how many creams and whites there were! The theme of my new bathroom will be luminescence. 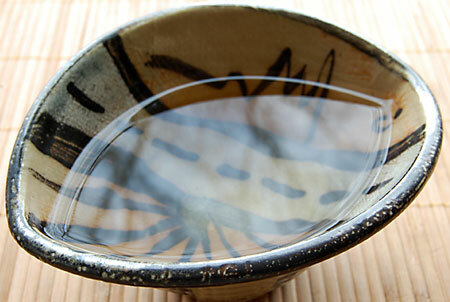 This entry was posted in Life Musings, Nature, Photography, Tea, Teaware, White Tea and tagged Formosa white tea. lovely photos you’ve captured of the tea. i have to wake up with a cup of joe. that’s my fix. but, i’m now tempted to start boiling some water. Karen, I hope you had a nice quiet Thanksgiving. The tea sounds smoothing.. Can’t wait to see your new digs. Formosa White sounds like a very interesting tea. My curiosity for white tea has been piqued. I now wonder what a good one is like and whether it’s distinct enough to impress me. It’s been a long time since I made the attempt to appreciate white tea and its days are coming again.